Lesley Conroy can currently be seen in The Cured on Netflix. Lesley is an Arts graduate of U.C.C. who also trained at the Samuel Beckett Centre, Trinity College Dublin. Lesley received an IFTA nomination for Best Supporting Actress for her role as Eilish Moore in the film version of Eugene’s O’Brien’s Eden. She is currently being seen in the Feature Documentary Citizen Lane and The Cured in cinemas. Other Films include – An Créatúr, Strength and Honour, Angela Mooney Dies Again, The Hideaways and Love Rosie. Notable TV credits include Aoife O’Neill in Fair City. 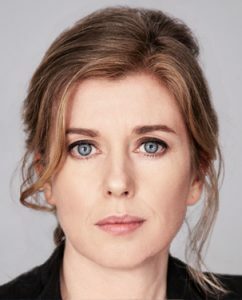 Detective Sharon Kelly in Mattie staring alongside Pat Shortt (RTÉ), the award winning political drama The Running Mate and Fir Bolg (TG4), School Run (TV3), The Clinic and The Big Bow Wow (RTÉ). She played Annie in Life’s a Breeze, alongside Fionnula Flanagan and Pat Shortt, directed by Lance Daly. She was nominated for Best Actress in Helen Flanagan’s short film The Drive in the Underwire film festival, London. Theatre credits include Snake Eaters (The New Theatre, Dublin) Eden (Decadent theatre company), King Lear (Second Age), Top girls (Gallowglass), The Duchess of Malfi and The Spanish Tragedy (Loose Canon) Animal Farm and A Clockwork Orange (Corcadorca). Her work for the Abbey Theatre includes En Suite, Something’s in the Way, Cúirt an Mheán Oíche and Caoineadh Airt Uí Laoghaire. Lesley has recently completed a tour of The Mai. She has also appeared in many Irish language productions with Belfast based Theatre Company Aisling Ghéar. Lesley’s radio work includes the title role in John B. Keane’s “Sive” for RTÉ Radio. Strength and Honour Ciara Mark Mahon Strength and Honour Prod. Ltd.
Samuel Beckett Centre, Trinity College, Dublin, 2 Year Actor Training Course. 1 year intensive physical training with Loose Canon Theatre Company. Berlinale Talent Campus 2003, tutors incl Mike Figgis, Wim Wenders, Anthony Minghella. 12 week jazz singing course with Edel Meade.